withings steel hr 36mm used with huawei silicone band. Condition is Used. Shipped with USPS First Class Package. Item model number: HWA03 Black 40mm. Sleep Monitor, Water Resistant SmartWatch. Water Resistant to 50m. follow Path. Smart notifications & Alexa integration. In addition, no representations of the manufacturer's warranty is made. The watch works great and looks great. Its not going to help for any issues. See pictures.Pictures show the actual item and whats included. Model: 3700546701450. WITHINGS GO WAM02 PINK. Sleep: Monitor your light, deep & awake cycles; Easy to use: High-readability E Ink screen & up to 8-month battery life. Compatible with iPad, iPod touch running iOS8 . Item is new and has not been previously used. What's Included. Trending at $58.72eBay determines this price through a machine learned model of the product's sale prices within the last 90 days. Withings Steel HR is a high-quality hybrid smartwatch crafted with 316L stainless steel that moves with you—office, gym, pool, and everywhere in between. Withings Steel HR. Beats per minute. Low power consumption. Sedentary remind: Sedentary remind. Sleep monitoring: Sleep monitoring. Others: Alarm clock, calendar, stopwatch, Calculators etc. Series: LEMFO KW88 Smart Watch. Does Not Apply. Band Color: Black Custom Bundle: No. Withings Steel HR Hybrid Watch. From swimming & running to ping pong and volleyball—visualize your cardio fitness progression in the app. Steel HR Sport can assess your cardiovascular Fitness Level when you run based on the maximal oxygen consumption (VO2 Max) estimation. Automatic synchronization - Visualize trends and data on your smartphone with the free Nokia Health Mate app. From Nokia, their Stainless Steel 36mm Activity and Sleep Watch. Model: HWA01-Steel-Black-Inter. WITHINGS Activité. 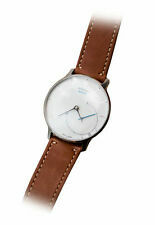 Stainless Steel case with high quality leather strap. No charging - battery lasts up to 8 months. Automatic synchronisation - Follow your data on your smartphone. Call Function: GSM/GPRS 850/900/1800/1900 four frequency conversation, Dial, hands-free, phone records, phone book, Bluetooth phone. Sleep monitoring: Sleep monitoring. Functions for iPhone - iPhone can't download the app, so functions are limited.iPhone can connect with this watch via bluetooth to make/answer phone calls,play BT music. Lightly used in very good condition. Introducing the new Accellorize Bluetooth Smart Watch. And by syncing it with your music, you’ll always have the right beat! Bluetooth Smart Watch (33105). Bluetooth Smart Watch features Make calls with hands-free Bluetooth. SIM Card: Single SIM Card (Micro SIM Card). Bluetooth: Bluetooth 3.0. Screen Type: TFT LCD. Screen Resolution: 240 x 240 pixels. WATER RESISTANT TO 50M - Steel HR is water-friendly - from automatic swim recognition to having no fear when you shower, go snorkeling, or get caught in the rain. SMARTPHONE NOTIFICATIONS - Call, text, event and app notifications from your smartphone right on the watch screen. A truly unique and stylish tool to inspire and empower a healthy lifestyle. ►Made from Sapphire glass, stainless steel & French calf leather. Choice of black or tawny brown. Fine calf leather strap. Withings Activité. Crafted by a team of prestigious Parisian designers, Withings collaborated with the Haas tanneries to develop a unique leather watchstrap, naturally tanned, and without the use of any chemicals. Withings hwa036-40 black sport android smart watch, Serial number : 2017DJ6648. 50m Bluetooth Smart. Withings / Nokia | Steel HR Hybrid Smartwatch - Activity Tracker with Connected. Condition is New. Shipped with USPS First Class Package. Nokia Health is now Withings. Withings/Nokia | Steel HR Hybrid Smartwatch. #418 in Smartwatch Bands. HEART RATE MONITORING - Maximize your workouts with continuous heart rate and in-depth reporting plus daily and overnight HR. Other breakdowns covered after the manufacturer's warranty expires. Includes 24/7 tech support. File a claim online or by phone 24/7. If you did not receive our reply. Nokia Health is now Withings. WATER RESISTANT TO 50M - Steel HR is water-friendly - from automatic swim recognition to having no fear when you shower, go snorkeling, or get caught in the rain. HEART RATE MONITORING - Maximize your workouts with continuous heart rate and in-depth reporting plus daily and overnight HR. HEART RATE MONITORING - Maximize your workouts with continuous heart rate and in-depth reporting plus daily and overnight HR. WATER RESISTANT TO 50M - Steel HR is water-friendly - from automatic swim recognition to having no fear when you shower, go snorkeling, or get caught in the rain. This item has been used for about a week and is in excellent condition. Water resistant to 50m - Steel HR is water-friendly — from automatic swim recognition to having no fear when you shower, go snorkeling or get caught in the rain.